The Huong Pagoda (English: Perfume Pagoda, Vietnamese: Chùa Hương) is a vast complex of Buddhist temples and shrines built into the limestone Huong Tich mountains. 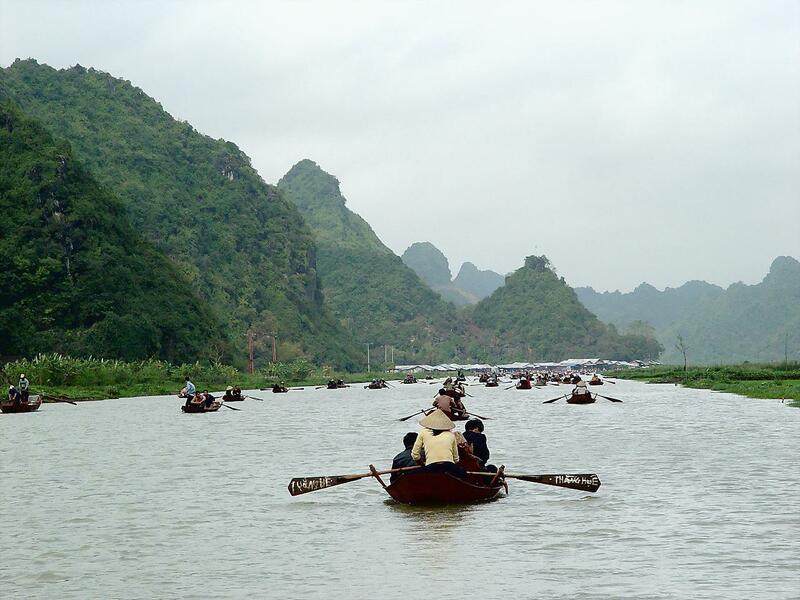 It is the site of a religious festival which draws large numbers of pilgrims from acrossVietnam. The centre of the Huong Temple lies in Huong Son Commune, Mỹ Đức District, former Hà Tây Province (now Hanoi). The centre of this complex is the Perfume Temple, also known as Chua Trong (Inner Temple), located in Huong Tich Cave. 7h45-8.30 Pick up from your hotel depart to Perfume Pagoda about 75km from Hanoi. 10.30: Arrive Yen wharf get on Boat to Perfume Pagoda. 11:15:Trekking up to Huong Son moutain then visiting Huong Tich Cave. ( other option you can chose cable Car is not included). 12:30 :Have Lunch at the restaurant. 13.30 :Visiting Thien Tru Pagoda. 14:00:Get on Boat back to Yen wharf. 18:00 :Arrive Hanoi. Tour end. - Pick-up and transfer by A/C modern bus. - Children under 6 years old will be free of charge. What do you think of PERFUME PAGODA (Full Day)?